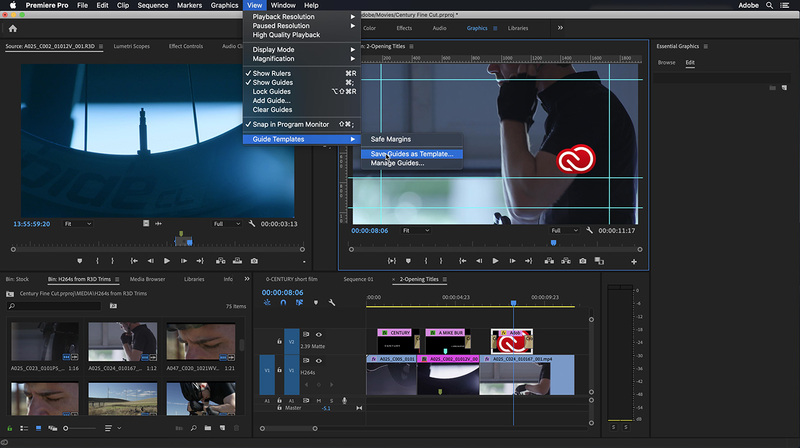 Yesterday, just days prior to the 2019 NAB Show, Adobe released new versions of Premiere Pro CC, After Effects CC, Audition CC and Character Animator. In addition to the new features, Adobe also included a variety of performance updates. Available immediately as a free update to Creative Cloud subscribers, Adobe will also demo this new software at the booth at NAB. At NAB, Adobe is also showcasing key partners, including Automate-IT, BorisFX, Cantemo, Cinedeck, Dataclay, Dalet, Dell, Chengdu Sobey Digital Technology, Codex, Empress/eMAM, Etere, Evolphin, GrayMeta, Marquis Broadcast, Support Partners, MoovIT, Primestream, Promise, Puget Systems, SciSys, and VSN. NOTE: The following information was compiled from a variety of Adobe-supplied press materials. New features include ground-breaking Content-Aware Fill for video, powered by Adobe Sensei, the company’s artificial intelligence (AI) and machine learning technology, along with new capabilities for titles and graphics, crafting animations, refining audio mixing, and organizing and preparing project media. Some of the hundreds of performance improvements include faster Mask Tracking for effects and color workflows, dual GPU optimization and improved hardware acceleration for HEVC and H.264 formats in Premiere Pro. 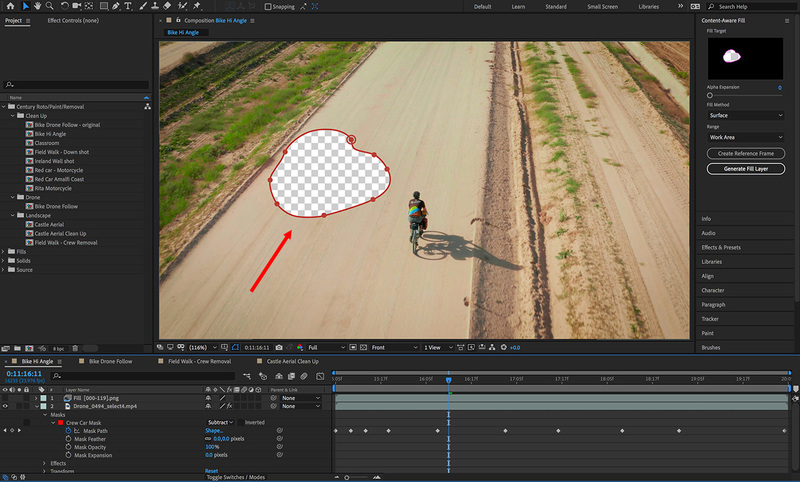 In After Effects, enhancements include GPU-accelerated effects, such as Change Color and Roughen Edges. Remove unwanted objects automatically with Content-Aware Fill in After Effects—Formerly Project Cloak, Content-Aware Fill for video is powered by Adobe Sensei and automates the process of removing visual elements like boom mics, signs, logos and even people from footage, saving hours of tedious manual work. 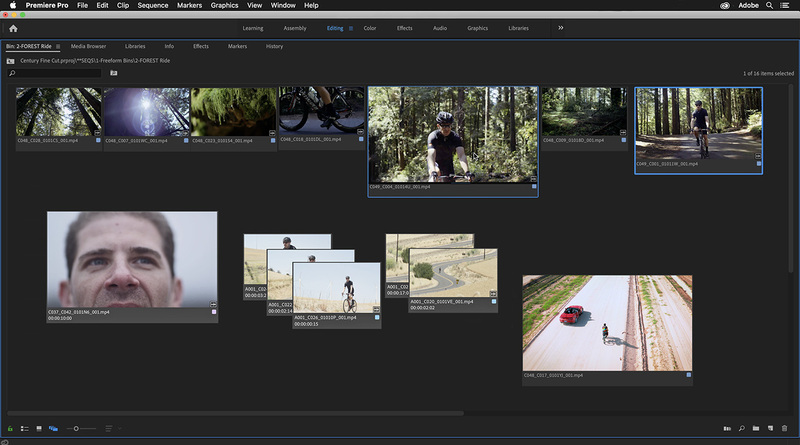 Organize and storyboard your media in the Freeform Project panel in Premiere Pro—Arrange assets visually and save layouts for shot selects, production tasks, brainstorming story ideas, and assembly edits. Design with precision and consistency with Rulers and Guides—Work with familiar Adobe design tools inside Premiere Pro, making it easier to align titling, animate effects, and ensure consistency across deliverables. 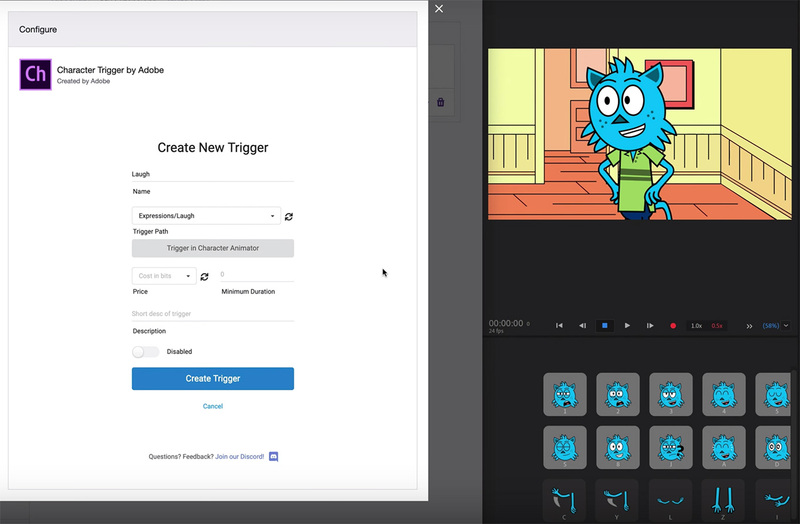 Surprise viewers in Twitch Live-Streaming Triggers with Character Animator Extension—Livestream performances are enhanced where audiences engage with characters in real-time with on-the-fly costume changes, impromptu dance moves, and signature gestures and poses—a new way to interact and even monetize using Bits to trigger actions. 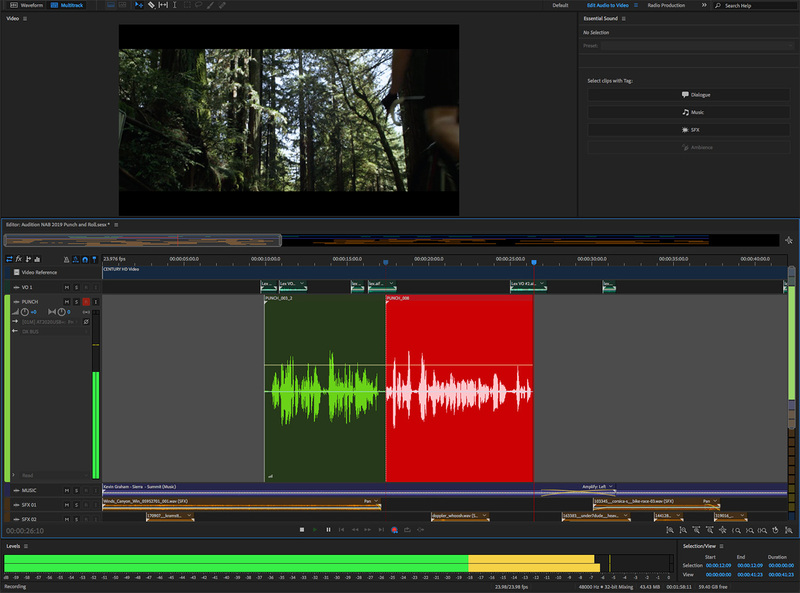 Generate an audio mix with Auto Ducking for ambient sound in Audition and Premiere Pro—Powered by Adobe Sensei, Auto Ducking now allows for dynamic adjustments to ambient sounds against spoken dialog. Keyframed adjustments can be manually fine-tuned to retain creative control over a mix. Add visual variety—Adobe Stock now offers an extensive collection of 10 million professional-quality, curated, royalty-free HD and 4K video footage and Motion Graphics templates from leading agencies and independent editors to use for editorial content, establishing shots or filling gaps in a project. From shoot to showtime—Premiere Rush, introduced late last year, offers an efficient mobile-to-desktop workflow integrated with Premiere Pro for on-the-go editing and video assembly. Built-in camera functionality in Premiere Rush helps you take pro-quality video on your mobile devices. UPDATE: One of the less-publicized, but more important, features in this update is support for dual GPUs. Premiere also now supports dual GPUs for faster rendering, color grading and exports. The latest release is focused on improved performance and refining the toolset. With more media and tighter deadlines, editors need tools that help them manage their content without losing sight of their stories. The new Freeform view expands the Project panel into an open canvas for organizing your media and visualizing ideas. Arrange clips, sequences, bins, and other assets into layouts that work with how you think. Color code clips, stack them in groups to save space, make hero shots bigger and build assembly edits you can drag onto the Timeline. Save different layouts for different tasks inside the same bin and move between layouts as you work. With options to show multiple types of metadata or just clip thumbnails, you control the look of your bin. The Freeform Project panel helps you work efficiently and think creatively. Work more efficiently with text in the Essential Graphics panel with all your titling and graphics tools in one place. Enhance titles with new options for adding multiple strokes and stroke styling to text, as used in Japanese and Korean titling and lower thirds. Make text and titles stand out with background fills or use masks with text for added impact. Working with fonts is easier, too. Sync free Adobe Fonts automatically, avoiding issues with commonly used missing typefaces; define your own default font as a fallback option. Replace fonts in your whole project with one click to easily update a design. This release gives you more options for creating graphics and animations in Premiere Pro. Group shapes and apply masks, all from the Essential Graphics panel. Drag and drop multiple Motion Graphics templates into the Essential Graphics panel for added efficiency. Ambience add atmosphere and a sense of place to video content. Auto Ducking leverages the power of Adobe Sensei technology to detect speech and automatically adjust the volume of ambient sounds below dialog, music, or sound effects. Adjustments are keyframed so you can fine-tune your mix. Your audio workflow just got better with user-requested improvements that let you re-order audio effects in the effects rack. Copy and paste effects and settings between audio tracks to improve your efficiency while refining your sound. Mask Tracking is significantly faster, even at high resolutions, for more efficient Lumetri Color and effects workflows. Hardware encoding for H.264 and HEVC is improved for smoother playback. Metal acceleration improves playback for RED footage. Better load-balancing for multiple GPUs, including eGPUs, provides faster rendering and exporting, especially with professional codecs, like Apple ProRes, RED, and others. A new System Compatibility Report utility checks for known issues, such as out-of- date graphics drivers to help ensure reliable performance. 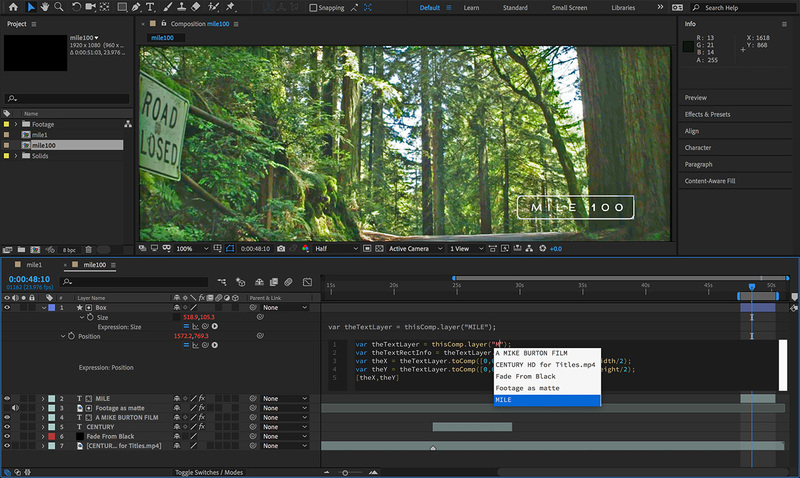 The latest release adds new features for removing objects from video clips, a better way to create Expressions, and more. 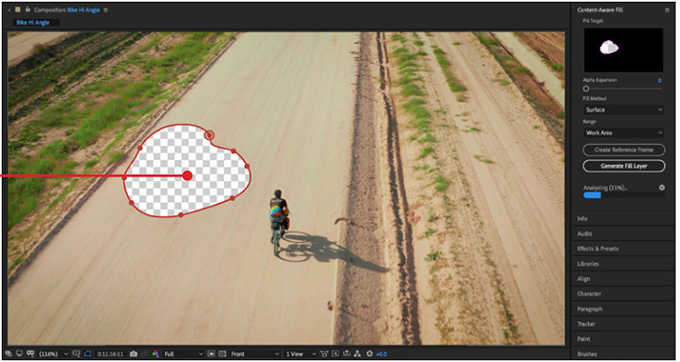 Powered by Adobe Sensei, Content-Aware Fill replaces masked objects, shadows, or blemishes with backgrounds generated from adjacent pixels and other frames in the clip. Incorporating technologies such as optical flow and 3D tracking, Content-Aware Fill estimates motion and depth of the masked object to intelligently assemble a replacement background. For complex shots, you can refine your results with reference frames edited in Photoshop. For 360 VR projects, Content-Aware Fill is an indispensable tool since there is nowhere “off-camera” to hide crew, tripods or lights. 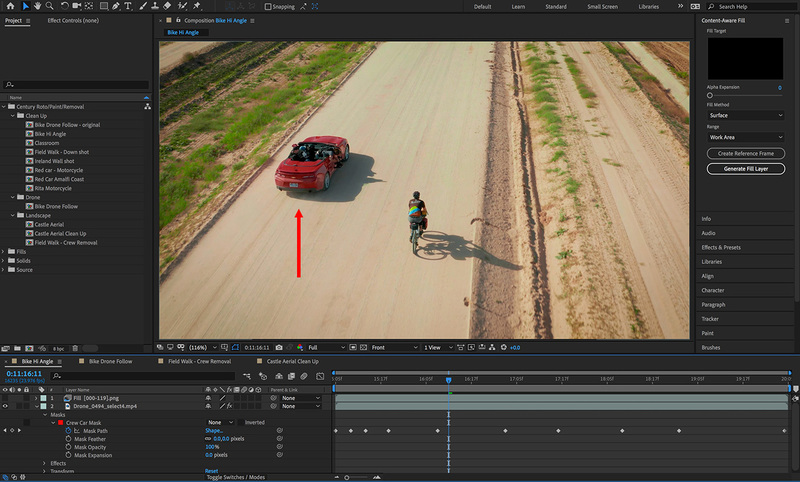 Content-Aware Fill can also be used to salvage footage by eliminating visual distractions or fixing continuity issues, like a car driving through the background of a scene, dust on a camera lens, or a misplaced prop. Customize your experience with a wide range of color themes to show the structure of your code. Locate issues faster with in-line error messages that give you the context you need to find the solution. Building on the Expressions engine, added in the Fall 2018 release, the Expressions Editor provides an improved workflow for creating compelling animations. Experience accelerated rendering when applying GPU effects such as Roughen Edges and Change Color. Both effects now support 16- and 32-bit color. Sync missing typefaces automatically with new automatic syncing for Adobe Fonts in After Effects and for Motion Graphics templates. Complex Team Projects now load faster and offer improved workflows between Premiere Pro and After Effects. Work more efficiently with RED RAW footage with new deBayering support for Metal on macOS. Support for Sony VENICE v3 has been added. After Effects also offers improved hardware decoding for H.264 and HEVC, providing smoother playback performance. Ensure visual consistency in your designs and across your team. Save Guide Templates in After Effects and share them with editors for use in Premiere Pro. The latest release offers full Punch and Roll recording, Auto-Ducking for Ambience, and workflow refinements that improve efficiency. New Punch and Roll recording in Audition provides efficient production workflows in both Waveform and Multitrack for long-form voiceovers and narration. Use it to accurately punch in replacement audio and continue recording a performance without interrupting your flow. An adjustable pre-roll, to match the cadence of your original recording, and visual countdown indicator achieve great results whether you are recording in a vocal booth or sitting at your workstation. Create richer soundscapes and bring more atmosphere into your mix, without obscuring other audio. 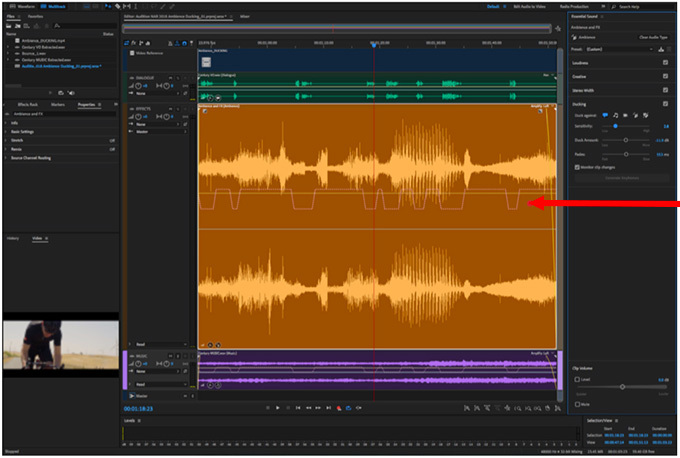 Part of the Essential Sound panel, Auto Ducking uses Adobe Sensei to automatically adjust the volume of background tracks around foreground dialog or music. You tell Audition which audio clips you want the audience to focus on and Auto Ducking creates a mix. You can “set it and forget it” while it works in the background or manually adjust keyframes afterwards to fine-tune the final result. Mix audio with greater precision. 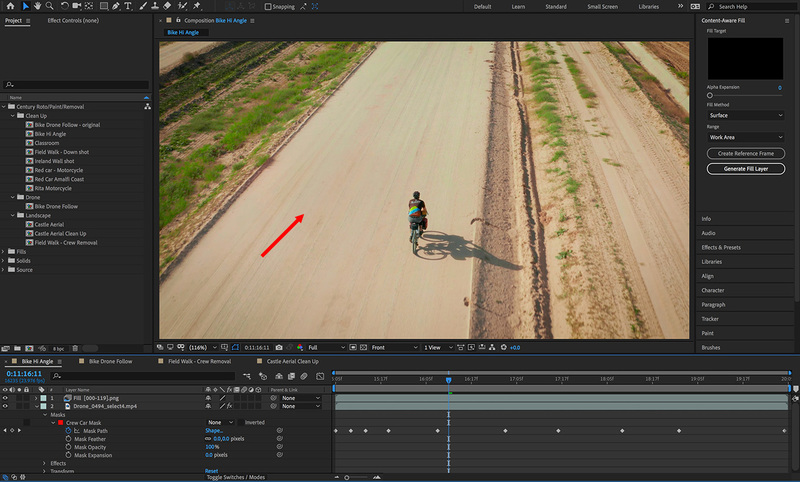 Manual keyframe value editing ensures your adjustments are exactly what you intend. Move clips between tracks without taking your hands from the keyboard with useful new shortcuts. A new Zoom to Selected Clips command gives you a flexible option for instantly zooming in or out to see your whole selection. With growing numbers of animation studios and productions embracing Character Animator, this release is tightly focused on streamlining the toolset, including better Puppet rigging and tagging, improved jaw movement and lip-synching, a new Twitch extension, and more. Shape the gestures and movements that give personality to your characters more easily. With better Puppet rigging you can apply behaviors, tag layers, and search through puppet rigs, allowing you to accomplish more within your established workflows. Apply attributes to single layers or any group of layers, simplifying the setup for complex puppets that allow for more nuanced performances. A new search filter makes it easy to locate layers and behaviors for improved efficiency. An improved visual interface for adding tags within the Puppet panel makes it faster and more intuitive to designate layers and layer groups as mouths, eyes, and so on, without relying on perfect layer naming. A new option to Swap Left & Right Tags makes it easier to modify puppet designs. You can now copy and paste handles from one layer to another layer on the same puppet for perfectly aligned magnets. Use the new Character Trigger extension for Twitch to enhance live-streaming performances by allowing viewers to trigger on-the-fly costume changes, impromptu dance moves, or signature gestures and poses. Surprise and delight your viewers, while adding interactivity and monetization to your Twitch channel. 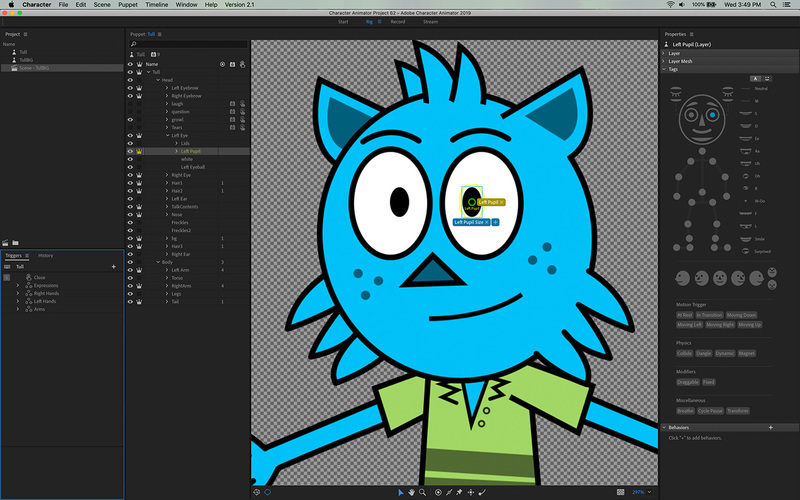 Characterizer is an Adobe Sensei feature that turns artwork into puppets you can animate in Character Animator. Characterizer now offers a faster UI, three new styles, and better final results, thanks to the power of Adobe Sensei.